EcoKnit® snag free quick drying towels are the most technically advanced energy efficient terry towels in the world, they are guaranteed to save you money and increase your laundry capacity. Thanks for visiting our website, and taking the first step towards a greener business and lower laundry costs. EcoKnit® towels are made by UK-based supplier to the hotel industry, Hartdean. From its inception in 1980, we have been constantly developing and perfecting the technology behind EcoKnit® towels, and today we’re proud to offer the most technically advanced, energy-efficient towels you can buy. Whether you run a small hotel or large commercial laundry, we can guarantee you’ll save money by switching to EcoKnit® towels. In fact, the savings you’ll make on water and energy mean you’ll soon recoup the initial cost. These savings mean EcoKnit® have the lowest laundering costs of any cotton towel available. Saving laundry costs and reducing dependence on non-renewable resources. Use less water per wash for huge long-term savings. Reduce your carbon footprint and show you’re making a positive change. Cut down on harsh chemicals in every wash cycle. Towels look and feel good for much longer so you can replace less often. What can EcoKnit® do for you? EcoKnit® technology has the potential to transform the way you do business – reducing energy consumption by up to 40% and water use by around 15%. Towels are dry and ready to use much quicker, increasing your laundry capacity without the need to invest in additional dryers. They also last two to three times longer than traditional terry towels, so need replacing less often. The product pays for itself through energy and water savings, giving you the lowest laundering cost of any cotton towel available. The reduction in carbon emissions could also allow you to benefit from Climate Change Agreement rebates in electric and gas rates. If you have your own laundry on site, you’ll experience the same benefits as commercial laundries with up to 40% reduction in energy and 15% in water. You’ll also be able to reduce your stock due to the faster turnaround time from laundry to bathroom. There are benefits for your brand too. By using EcoKnit® you’re setting a great example and showing your guests you care about environmental issues. 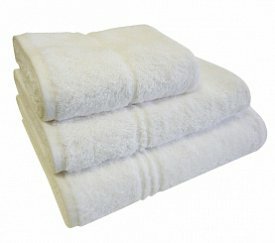 Guests will love the luxurious feel of the product and can often be encouraged to use towels twice and therefore help in preserving the environment. The towels dry quickly and we recommend you ask your guests to re-use them if they’re happy to do so. Millions of towels are laundered each day throughout the world producing vast amounts of carbon dioxide, this small change could make a huge difference to the hospitality industry as a whole. Want to reduce your laundry costs? EcoKnit® towels pays for themselves through energy and water savings, giving you the lowest laundering cost of any cotton towel available. See our contact page for details and talk to one of our team today. Download the EcoKnit® brochure in a simple take away guide to lowering your laundry costs and the advantages that EcoKnit® towels offer over other towels on the market.